I am a sucker for hand or footprint art! 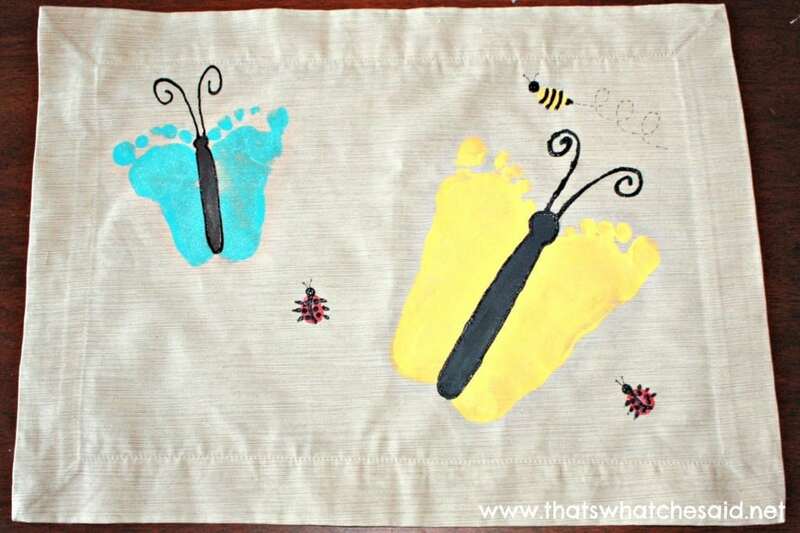 These Butterfly Footprint Place Mats could not be any cuter! 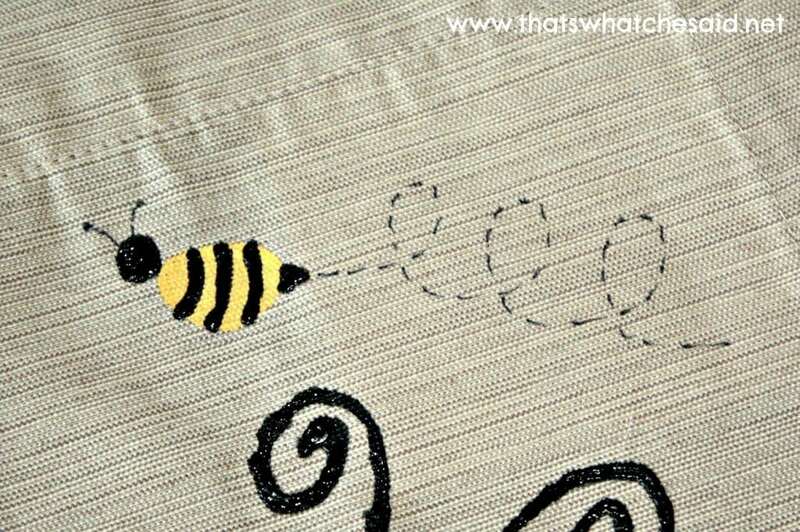 Use thumbprints to add a few bees and ladybugs as well! Patience! You are working with kids. Your choice of fabric piece: apron, tote bag, place mats, tablecloths, etc. Pretty paper/Pen or computer for Poem. 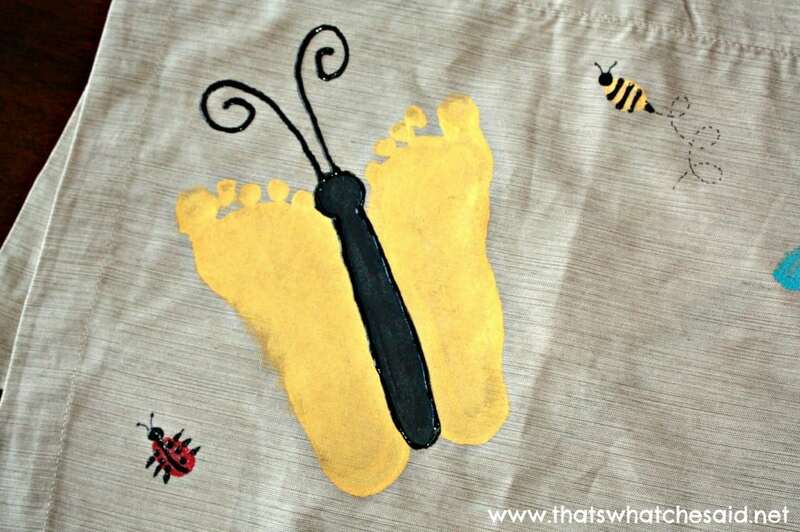 For the butterfly footprints you need to make sure you place the footprints with their big toes outward! So left foot on right side and right foot on left side! Using the paintbrush, paint in the body of the bug and use the puff paint for the antennae. *You can draw lightly with a pencil the shape of the body if you are nervous about just free painting it. Then use thumb prints for the lady bugs and bees. 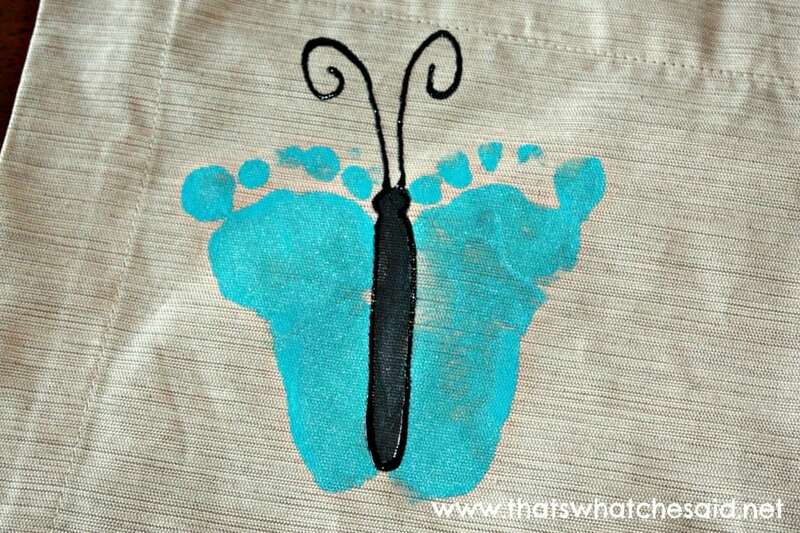 You can also do finger print flowers, caterpillars, small butterflies or anything your imagination comes up with! 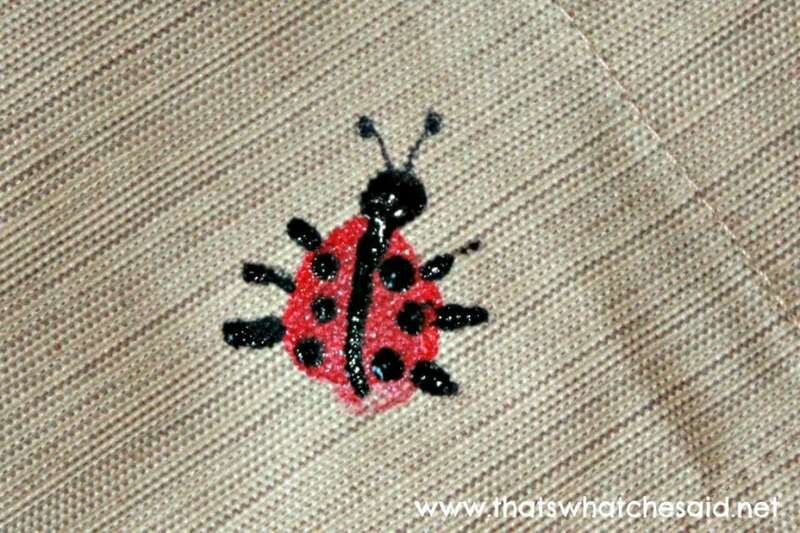 The puff paint or fabric pen can be used for the little bugs legs and antennae. Use the paper bags behind your piece. The paint leaks through. Write the kids names and ages on the back or inside of your piece with the fabric markers so you can always remember how old they were. It’s important to use permanent fabric paint, especially for aprons and things you need to wash…hence the fabric marker vs. permanent marker. Eventually the permanent one will wash out and it bleeds on the fabric. The Fabric marker will not bleed. As if the piece you made isn’t cute enough…add this poem and you will witness and actual heart melting! This (bag, apron, etc) is very special you see, because it was made from a piece of me! My thumb print made each bug part, To show you I love you with all of my heart. My footprint made each butterfly wing, Because to me you mean everything. It was a small challenge for Ryan’s print. I had him in his high chair and used large binder clips to hold the place mat onto a cutting board (stiff surface) in order to get his print because he could not stand on the place mat on the floor like Michael. That is also why there is a bit of dead space. I had to work fast! All in all I think they turned out great and I think my MIL will absolutely love them on her breakfast bar! You might also like these Thumbprint Heart Pendant Necklaces or these Thumbprint Ornaments as well! Sign up for my emails below and never miss a hand or foot print project! *This post may contain affiliate links. You may read my full disclosure here. Affiliate links help keep the content on That’s What Che Said FREE at no extra cost to you! Thanks for supporting me and companies and products that I think rock! So cute, pinning now! I might even do this for my daughter’s butterfly birthday party this summer!